Although I have had Deutz many times through the years somehow it wasn’t until a few year ago that it dawned on me what a fabulous house this is (in Champagne you tend to say houses instead of producers for the more known brands) when I tasted the 2006 Blanc de Blanc. Since then I have had the pleasure of enjoying many of their wines and always with the same excitement and satisfaction. Therefore it was a great pleasure to visit the house last week and meeting Jean Marc Lallier who is the last of the Deutz family still involved in the company, the last of the Mohicans as he put it. The Deutz story started in 1838 by two Prussian immigrants, William Deutz and Pierre-Hubert Geldermann, who thanks to their dynamism and their relations created a strong demand for the Champagne in England and Germany. In 1906 the house came to descendant René Lallier but difficult times were to follow with the Champagne riots of 1911, the First World War; the Great Depression of the 1930s and then World War 2. In 1938 René Lallier's son Jean took over and him and his son André developed Deutz to a top quality house by expanding vineyard holdings integrating modern equipment in the winery. Despite excellent reputation and quality of the wines, Deutz run into some financial difficulties after having lost one of their main connections for the UK market and with the Champagne crisis early 1990´s a majority interest was sold to Champagne Louis Roederer. As the Rouzeau family of Roderer have a high regard for the family business model the only provides financial stability yet allows Deutz to maintain autonomy and an independent identity. During our visit Jean- Marc said several times that the key focus for the style is continuity (like for any Non-Vintage Champagne), finesse and elegance. 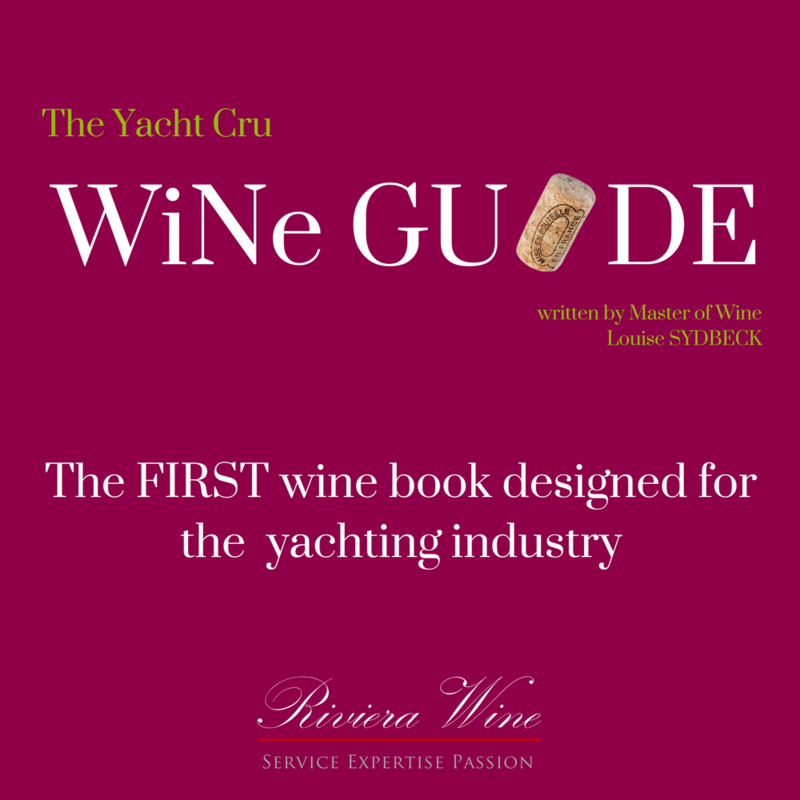 As opposed to the general style of the Champagnes from Ay (a Grand cru village in Champagne), which is quite powerful and broad, the wines of Deutz are often considered more feminine and finesse- full- if that is a word. In charge of the cellars today is chef de cave Michel Davesne and Jean-Marc plays a key role in the blending sessions. The house owns 42 hectares of vines, which account for just over 20 percent of its needs. As all houses in Champagne the rest of the grapes are bought from the surrounding growers. They have supply contracts with around 45 different families whom they have worked with for a couple of generations and to keep a close relationship they often organize events and technical seminars. Winemaking is typical for the region: Handpicked grapes, pressed as soon as possible, with only the first portion (cuvee) of the pressing, is used. 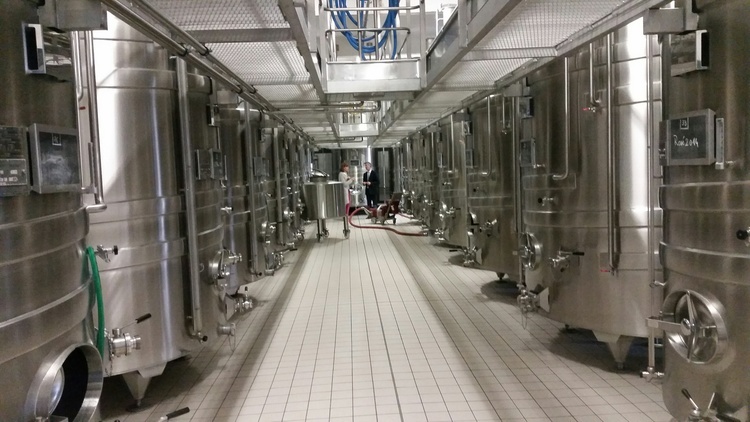 The wine is fermented by parcels in small (100 – 125 hl) stainless steel tanks at around 18 degrees Celsius with selected yeast. What is particular for Deutz however is that they keep their reserve wines (reserve wines are older wines that you use for blending to create a consistent style for the Non Vintage Champagnes) for only 4 years in order to retain freshness and a vibrant core. Reserve wines at Bollinger for example or Krug are kept for up to 15 years. After the second fermentation in the bottle, which is when champagne receives its bubbles, the wines are kept on the yeast bed for a long time to impart the all-important autolytic character to the Champagne. 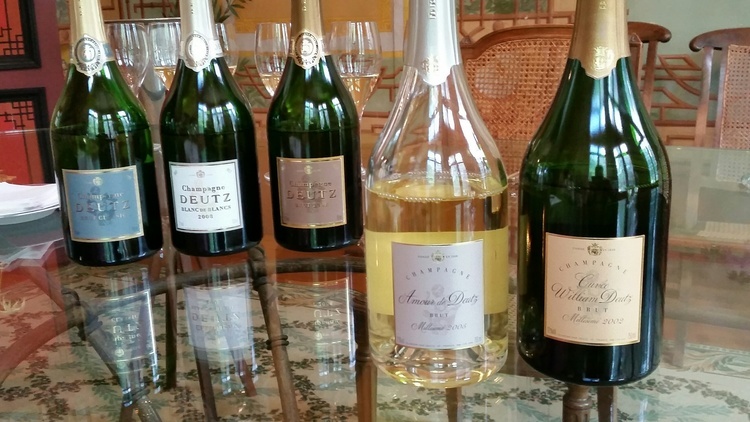 The minimum by law for a NV Champagne is 15 months but at Deutz (and all other serious houses) they keep the NV Champagne for 3 years, the vintage for 5 years and the top wines, William Deutz and Amour de Deutz for 13 years before release. The longer a wine spends on its lees the greater the complexity, generally speeking. After a very complete and interesting tour of the cellar and private hotel we sat down for a very memorable tasting. Inviting nose of baked pear, brioche, marzipan and white flowers. Palate is ripe, round and slightly loose-nit in structure. Finely balanced with great intensity and delicacy and a lingering finish. Notes of white flowers, creamy lemon pie and light toast, lovely nose. Palate is pure, focused and vibrant. Tight structure, elegant and excellent finish. Baked apple, mineral smoky nose with floral hints- almost pot pourri, complex and deep. Palate is firm, broad and rich with excellent concentration and a silky texture. A long broad palate length and elegant finish. An introduction to William Deutz. This wine was created in 1993 to be ready for the millennium and is since one of the finest Blanc de Blanc on the market. A delicate fragrant nose of lemon and white flowers, soft toast and a mineral undertone, slightly closed at first. Palate is wonderful and more accessible than the nose offering purity,concentration and a razor like precision. Very elegant and fine, flavors of fresh almonds and lemon cream. A bitter quince like finish which is very very long. This is a Blanc de Blanc, so made of 100% Chardonnay. A powerful mature, nutty caramel nose with baked apple, brioche and perfume of dried flowers. Very elegant and intriguing nose. The palate is equally powerful and broad. Elegance and intensity is combined in this opulent lovely Champagne. Mineral firm back bone giving focus and precision yet very creamy. Flavours of toast and notes of white chocolate. Long and lovely finish. It was a great treat to taste this rosé as it had just been released on the market and 2006 is the first vintage it was made. This prestige rosé is replacing the William Deutz rosé which is no longer made. The elegant, mineral and fragrant nose shows notes of nectarine, white flowers and soft brioche. Palate is pure, elegant and focused. A tight-nit silky structure with a mineral firmness and crisp firm acid. Slightly closed but with an inner power for a fantastic future. And by the way, if you buy a bottle of amour, don’t through away the capsule! They are gold plated and are designed to be transformed to a necklace!